Christmas approaches, and George proves once again that he makes a fine Santa. He played the part first at 15. A pubescent redhead weighing in at about a buck and a half – very authentic. Well played, Cambridge, Ohio Sears. He donned the beard and boots again more recently. 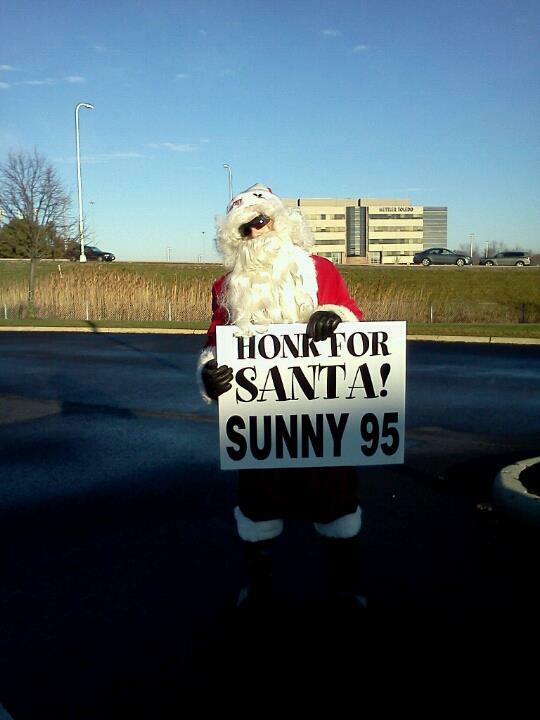 Perhaps you saw a bunch of Santas at various Columbus intersections dancing around with signs urging you to “Honk for Santa and Sunny 95!” George was one of those, and he had a lot of fun, even though he did get a one-finger Christmas salute from a guy who apparently saw right through a moonwalking Santa and his war on traditional holiday dance. In between these stints, I would sometimes lend George out over the phone for nieces, nephews and friends’ kids. He has that nice, full baritone, does a great ho ho ho, and has literally no choice as I promise his services without checking. Eva dropped the phone and hid under a nearby table. I should point out that George has been known to frighten children to tears. Usually the children sit in their itty bitty jerseys or cheerleading onesies and George startles them from across a restaurant with a burst of fan passion. George is loud. Of course, being a Browns fan, sometimes George cries, too. Eva’s mom Heather picked up the phone, coaxing some conversation from her wee one, still safely tucked beneath the kitchen table. George was a bit wearied by the time he got off the phone, but he needed to gumption up because Ruby was waiting. At that point, Santa was dreaming of a gracious way out, but Ruby was having none of it. How did she know about the moonwalk? George has been on Santa vacation since then, but I was just thinking of a fun new plan, what with that fetching suit and all. ← For Your Queue: Freaky Fine Friedkin!